If someone in your family is having a problem with drugs or alcohol unless something major happens they might not realize they even have a problem. Instead of waiting until they get in an accident, OD, or hit rock bottom, you may want to stage an intervention to help them see the error of their ways. Before you intervene in the addictive habits of someone in your family or friend circle, you should make a plan for how you are going to do it. Here are some steps to take before you start talking. Before you call in the troops and place blame on someone for having a problem, make sure you know for a fact they have a problem. Know the signs of addiction. If you’re seeing a change in the way this person is with friends, family members, and their job, then you have something to work with. You may even want to find out what it is they are using. While you might not want to invade their privacy it may be in their best interest for you to look and find out what drugs it is they are abusing. This may matter when it comes to getting them help. Before you start this intervention you also want to know what the possible consequences could be, and you need to be ready to accept them. Your confrontation could send them over the edge and lead to an OD or something worse. You may also chase them away and then who knows what will happen. 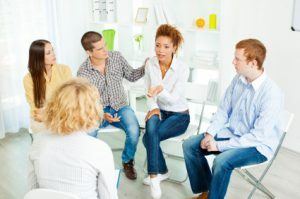 This is why it is important to have a therapist that is experienced in addiction with your group when you do the confrontation. Talk to the people that will be present at the intervention prior to it all happening. Find out what page everyone is one. Come up with a strategy together and share your concerns with one another. The team you have working together for this intervention is going to make a difference in how things work out. You need to have people there that truly care. Don’t sugar coat things when it comes to the intervention. Be honest with the addict about what their addiction is doing to them and the people in their life. Maybe someone ended up hurt because of them, talk about it. Maybe they are going into extreme debt or putting someone else into debt, and you need to bring up the money problem. If they haven’t slid that far downhill yet, you may want to give them realistic examples of what their addiction could do to them, and how it not only hurts them but all of the people in their life.